Our everyday choices as individuals are driven by what we can do to make the smallest impact on the health of our world. Fix everything you can, with anything you have. Manifest the reality that you believe in. That’s what drew us to create, own, and operate Manifestation PDX – an 8,000 sq. ft. art collective of 15 artists working in many disciplines to create a full spectrum of artistic expression and serve as an incubator of creative culture. Designing and creating sculptural objects for over two decades, much of our work is inspired by nature and the exploration of our interconnection with the beautiful living world around us. 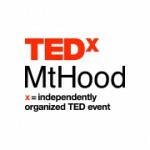 As the Artist In Residence for TEDxMtHood this year, we will demonstrate that interconnection and speak about the ways you can reuse the things around you to create new, beautiful pieces of art. Our continuous intrigue with the human condition inspires us to explore how to reduce our footprint on planet earth. We believe that the best way to improve our communities, our environment, and our world is by expanding the possibilities of the people and facilitating their creative expression. We frequently work on community based projects and are driven to engage the public in art that exposes them to new perspectives and connects them with their environment. Our found object and fine metal sculptures have been commissioned for private homes and gardens, businesses, development firms, community spaces, and art and music festivals. We enjoy making art out of junk and what many would consider trash. We want people to see that with a little thoughtful effort, they can formulate their own world with reusable items that they already have on hand. The factories pumping out streams of stuff need a break and a new formula for production, but until then we have to use creativity and ingenuity to make what we really want and need. Given the speed we are consuming our planet Earth, we must find it within ourselves to achieve balance in our resource consumption. The energy we exert to make the most mundane “disposable” items is not worth the cost of resources, and the cost to our environment. We must learn to make things that require less energy to make and will last longer. Until we all reach that level of realization, it is an important opportunity for artists to help the public see that the longevity of material goods can be extended indefinitely through creative uses of materials. This is the belief and inspiration behind many of our artistic endeavors, and will be the focus of our Artists In Residence installation and TEDx Talk on June 18. 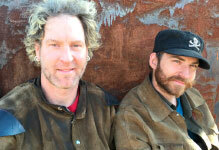 Manifestation PDX was founded in 2013 by Gustav Sculptor and Richard Cawley. It’s a 8,000 sq. ft. Art (ware)House that facilitates and encourages the creation of art and ideas for the beautification and betterment of our world, and a more sustainable future. They build sculptures primarily out of steel, and incorporate as much post consumer waste as possible in their designs. They have built interactive sculptural installations for many art festivals such as: Oregon Country Fair, Portland Winter Lights Festival, Winter Fest NW, What The Festival, and the Burning Man Arts and Culture Festival.